FOR Philips Gold American import Bojana Todorovic, it’s an advantage knowing how to communicate with her Filipino teammates in their native tongue. Todorovic continues to deliver for her team after a 25-19, 21-25, 27-25, 25-23 win over Meralco Tuesday night in the Philippine Super Liga Grand Prix. The former University of California-Los Angeles player showed that as much as a good follower she is, Todorovic is also a leader on the court. And her being familiar with certain Filipino words is a big help. Aside from ‘salamat’, the first Filipino word she learned, the 24-year old outside hitter adds ‘bilis,’ ‘galaw’ and ‘usap-usap’ to her vocabulary. “Very vocal talaga ‘yang si Bo, kasi sa States libero siya (sa US national team). 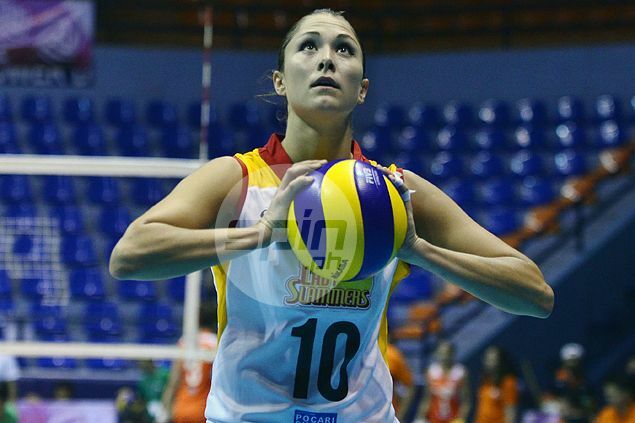 Eh normally sa libero madaldal talaga,” said Lady Slammers mentor Francis Vicente. “Kaya ngayon tinuturuan na namin siya ng iba pang Tagalog kasi minsan ‘yung (local) teammates niya sisigaw ng ‘bilis!’ eh hindi niya alam ‘yun, minsan naman ‘galaw!’ or ‘usap-usap’ kaya tinuturo namin sa kanya,” added the veteran coach. Despite being in the process of learning the language, the Serbian-born volleybelle played a major factor in Philips Gold’s second win in three outings. Todorovic had a game-high 23 points, registered seven digs, and had 11 of the team’s 26 excellent receptions. Philips’ only loss of the tournament was five-setter defeat at the hands of fancied Cignal.